It’s funny, the things that gardeners gauge the garden season by. Some people plant according to certain holidays, some people trim their bushes according to when the village picnic will be, and I know I’ll be bringing in the harvest by our second son’s birthday. We might pick a few things here and there, like peas and lettuce, but the bulk of it starts to trickle in during the month of August, and by mid-August, we’re drowning in produce. Just this past week, I harvested a whole bushel of green beans in one day! And I intentionally let some of my zucchini get overgrown so that I could use them to experiment with Common Sense Home’s recipe for Zucchini Gummy Candy. 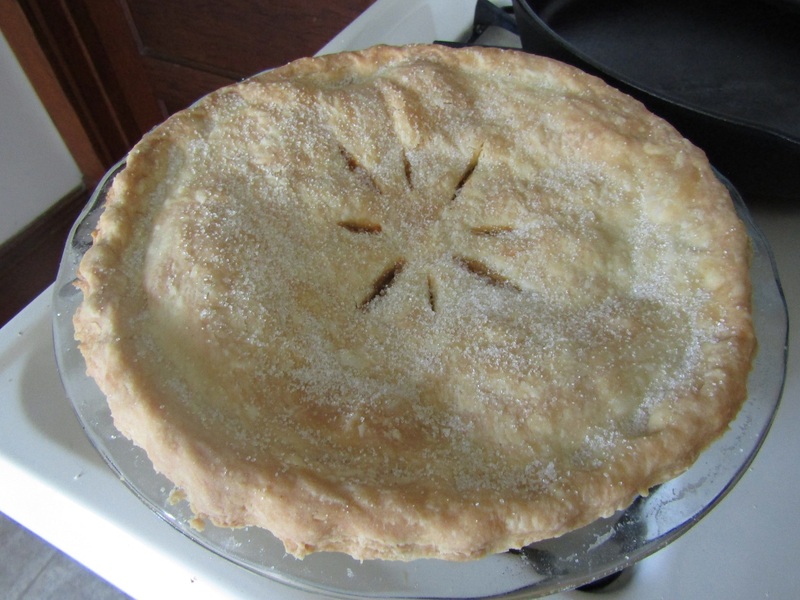 The week before, I tested her recipe for Zapple Pie. It was definitely best served warm, something about it hid the artificial-ness of the apple replacement, but even so, I was impressed. The tomatoes have been coming in, and I’ve been harvesting them even when they aren’t fully ripe because getting out into the garden has been a bit of a challenge for me this year. As they ripen, I cut off the tops off of the tomatoes and stick them in gallon freezer bags and freeze until I have enough to make a large batch of tomato sauce for canning. So far, I have nearly 4 gallons of tomatoes in the freezer, and about another 2 gallons sitting on the kitchen counter, ripening. I had plans to pressure can my green beans on Thursday, but when I went to get the pressure canner, the weight for it was missing. I had to place an order for a replacement part to come the next day so that our food wouldn’t go to waste with the wait we would have had over the weekend. Sure, I could have frozen stuff, but the point of having a pressure canner is to get things canned so we aren’t relying on the freezer. I did end up having the kids help me snap a gallon of green beans that needed to be dealt with that day, and we blanched and froze those. It’s looking like it is probably going to be our best gardening year yet, which I’m pleased as punch about. It means all of that hard work and planning earlier in the year has paid off! 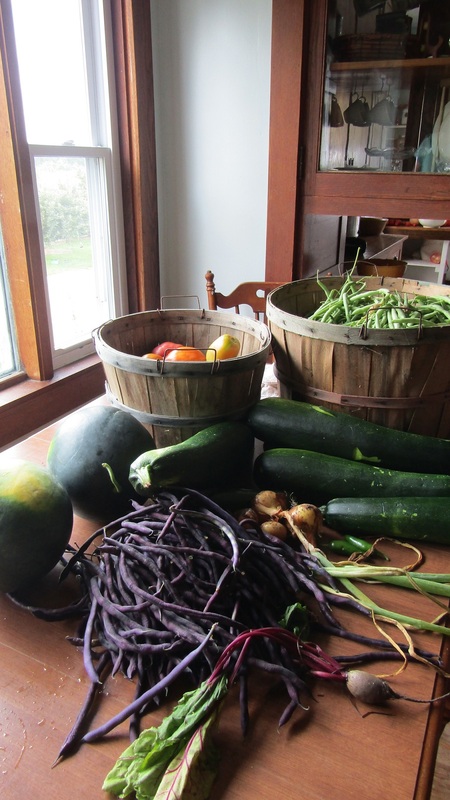 We’re quickly getting to a point where the amount of produce we have harvested is equal to the amount of money we spent on seeds for the garden. One day’s worth of harvest. My favorite thing about gardening is when the harvest starts to really come in and it’s time to begin preserving our bounty. Of course, we try to incorporate a lot of fresh veggies into our daily meals during these months of harvest, but the bulk of what we grow is meant for storing for later use. Over the years since I began gardening, I’ve done a lot of research into the different methods of preservation, and I’ve slowly added new methods throughout the years. Here’s a list of some of the more popular options for preserving your bounty. Freezing, Water Bath Canning, Dehydration, Dry Storage/Root Cellar, Pressure Canning, Fermenting, and Freeze Drying. If you’d like some inspiration for how to put up your harvest and want to learn more about each of those methods of preservation, join me over at Minnesota Country Girl where I have the privilege of guest posting for Homestead Winter Prep: A Series of Harvesting & Preserving! My post isn’t the only one in the series… there have been a few published earlier this month, and there are more to come during the remainder of the month. Be sure to check them out! I’ve always stuck my tomatoes in the freezer completely intact, but this year the tops are cracking badly due to all the rain we’ve been having and I wondered if I could cut the tops off. Your post tells me YES, and also that I can cut the tops off of all my tomatoes, cracked or not – so I’m going to do it that way from now on. The best thing about freezing them first is how easily you can slip the skins off! Thanks! Hopefully that little tip helps! The skins come off so nicely when frozen, but the tops are a pain to remove when everything is mushy! Oh my gosh, I am going to have to try freezing my tomatoes! What a great idea! Also, your harvest is so impressive! What variety of beans did you plant? I was so glad I had learned that tip about freezing. My first few years of growing tomatoes, I let too many go to waste because I never had enough to do anything with at one time. And thanks 🙂 I’m pretty pleased with it. Looking forward to putting up a lot more food this year! The green beans are Blue Lake Bush beans. I planted a TON of plants this year! And the purple beans I think are Carminat from Johnny’s Select Seeds. I wanted to try something different, and they are just so pretty! Love those purple beans!! I have been freezing my tomatoes as well when I get them. Haven’t had time to deal with them the last two weeks.